The global shortage of airline pilots has created opportunities for career-oriented people to successfully begin a career flying for the airlines in the U.S. We at ATP have been working hard to help interested people achieve those career goals and have seen countless success stories such as the story of Robert Norris. Robert is the latest addition to ATP’s Instructor Corp and is months away from a job flying an airliner. Robert began by asking for advice from mentors who are ATP Airline Career Pilot Program graduates who are now flying for the airlines. Chris Carey is one of those graduates now helping bring new pilots to the airline industry and he tells Robert’s story. As one of the mentors on www.airlinepilot.life I get to chat with a lot of people who are exploring the idea of joining the airline pilot profession. One of those was Robert Norris, who joined the discussion in November of 2016, a few months before making the decision to complete his training with ATP. 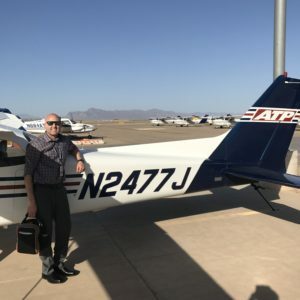 Over the course of his training, Robert posted several updates, including the one that we were all most thrilled to see, that he had finished his training program and would be joining the flight instructing team at ATP. I was really impressed by Robert’s story and asked him to expand on it. What follows is an inspiring story of a man who, in his early thirties, decided to change his entire life and pursue a career as an airline pilot. My father was aircraft mechanic for American Airlines for thirty years. Prior to that, he worked on OV-10 Broncos in the Marine Corps. I remember a few times as a child getting to sit in an airliner and watch as my father performed maintenance checks. I remember being absolutely amazed by all of the buttons and switches. You could easily say that flying is in my blood and has been since I was very young. I was born in Denver, Colorado, my family soon moved to Dallas, Texas for three years, and then settled in San Diego, California around the time I was in 7th grade; all of the moves were due to transfers for my dad’s work. After high school, for various reasons, I opted to not attend college and instead enter the workforce. I worked many different jobs prior to flying, I sold motorcycle parts in Denver, I spent several winters as a ski lift operator, but the majority of my adult life has been spent as a construction worker, remodeling apartments in San Diego. I actually started flight training in 2002, and logged around ten hours, but my young age, lack of drive, and lack of funding postponed my dream for a decade and a half. Three years ago, on my thirtieth birthday, my sister gave me an introductory flight to a flying club at KSEE (Gillespie field) in El Cajon, California. I decided after that flight that I would pursue my private license. I sold nearly anything I had of value and downsized in order to afford my training. I learned in Piper Cherokee Warrior IIs (1970’s models) with only VORs, no GPS. It took over a year flying once a week or so. After I got my certificate, I flew another thirty hours taking friends on sight-seeing flights over San Diego, flying the class B transition off shore at 500 AGL under the departure path of Lindbergh Field (KSAN), around Point Loma and into the San Diego Bay, then a climb to 1000ft to clear the Coronado Bridge and get a better view of the aircraft carriers in port, as well as downtown San Diego, it was incredibly beautiful flying. I knew that I wanted to make flying my life, I was no longer looking forward to putting on paint-stained clothes to go to work, dreading every Monday and hoping Friday would show up early. I did a lot of research before deciding on ATP, including chatting with the mentors on www.airlinepilot.life. I convinced my girlfriend to quit her job of ten years and move to Phoenix, Arizona with me so I could pursue my dream, she’s a keeper. I started on Feb 13th, just a week after moving my entire life to a new city. Six and a half months later, after lots of sleepless nights and hours upon hours of studying, I had passed every check ride on the first attempt and was a freshly minted Certified Flight Instructor. It all happened so quickly that I barely had time to realize what had occurred, I had taken my life further forward in these short months than I had in all the years that had come before it. Robert is now instructing with ATP at their Phoenix-Mesa Gateway location and is looking to continuing his father’s legacy with American Airlines as he has his eyes set on flying for Envoy Air, a wholly owned subsidiary of American Airlines. ← Airline Pilot: The pilot shortage trend.